Toy Story kids bedding collection quilt size 140x200 and 160x200 with characters: Sheriff Woody, Slinky Dog, Mr. Potato Head, Rex and Buzz Lightyear from the Disney Toy Story Movies. Very funny stories from the life of Andy toys wo always escape from any oppression. Toy Story bedding set, children towels with the image of Buzz-a and blankets and accessories with movie characters are carefully made from 100% cotton according to OEKO-TEX 100 guarantee the safety of your baby’s skin. 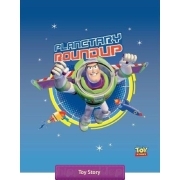 Gadgets with characters from Toy Story is an interesting offers for fans of adventure Andy toys.